A five week long project that aims on redesigning Seattle's transportation system. After taking a look at existing modes of transportation from gondolas to trains and water taxis, we decided to focus on the carpooling system. We planned to target routine commuters and integrate the current VanPool system with this audience. VanShare is a public carpooling program that provides an easy process to find a van, intuitive scheduling, and a personalized experience. Our application locates a van according to the rider's schedule and availability of vans in the surrounding area. There all vans are in use, the rider is put on a temporary waiting list and has access to real time notifications where they can see who they are riding with and when they are going to be picked up. If we had the opportunity, how might we redesign Seattle's public transportation service system? My group and I researched various types of transportation systems and interviewed people who use public transportation on a daily basis. We found that public transportation falls into two categories: routine commuters and infrequent users. Out of the many 350,673 workers in Seattle, only 18.5% use public transportation, while over 66% of daily commuters drive alone. 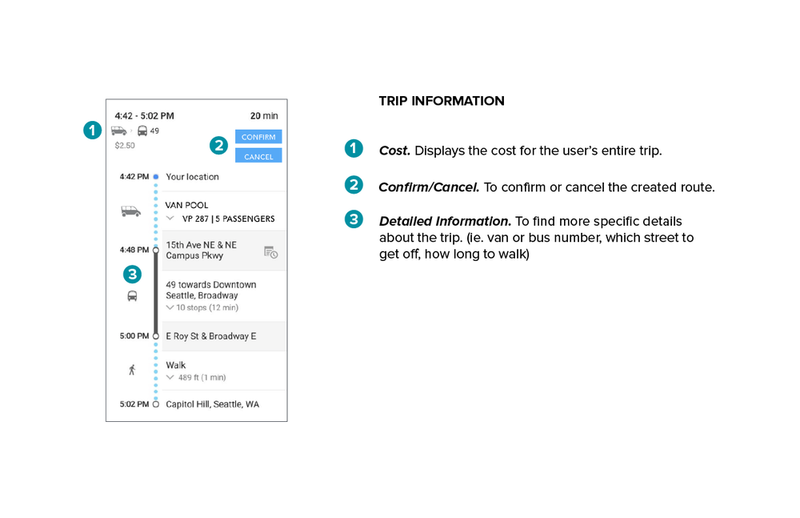 After synthesizing our research, we decided to target routine commuters and redesign the existing service, VanPool. We decided to focus on these areas because the VanPool system is an already existing service that can be easily manipulated and decrease congestion of traffic at peak times. A public transportation service that takes advantage of the existing Metro VanPool and combine it with the characteristics Uber and Lyft where the passenger can call a VanShare at any time. For our first prototype, we wanted to incorporate our VanShare system with the buses as a drop off and pick up station. 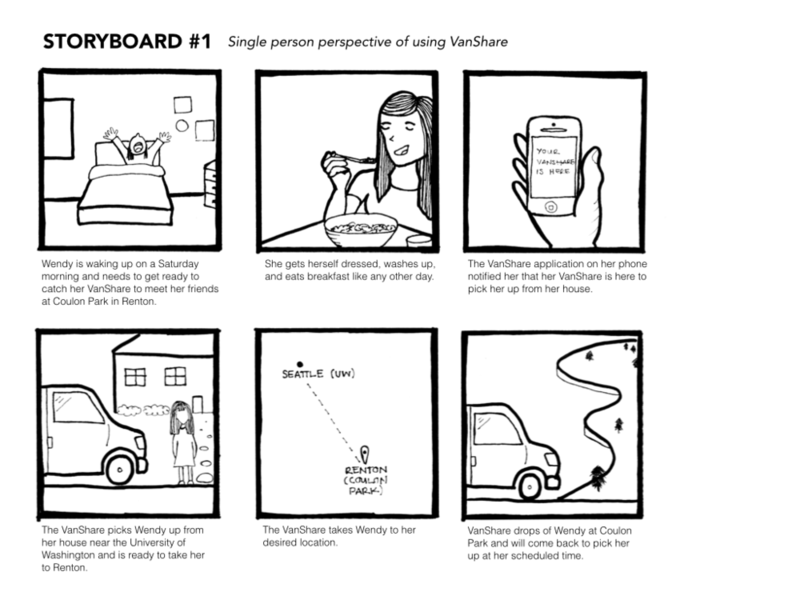 However, we found it was unlikely that the user would experience a seamless trip where a bus drops them off and a VanShare is there ready to pick them up.